Live New Orleans jazz band, dedicated to playing the music of Satchmo! Popular Louis Armstrong songs and other similar tunes, creating the typical playlist for the Louis Armstrong Society Jazz Band. Louis ArmsCtrong songs, plus a few other favorites! 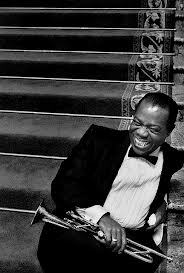 This is just a sample list of Louis Armstrong songs and other favorites to give an idea of the style and feel that the Louis Armstrong Society Jazz Band is known for. The band mixes the traditional New Orleans genre with selections from the Great American Songbook. Of course, we take requests and customize each show as appropriate! To hear the band play live, check out the Louis Armstrong Society YouTube page.